A shirt worth its weight in gold. Litterally. 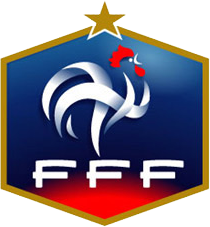 Latest news on Friday: France has officially changed its team sponsor. Yup, no more Adidas for Les Bleus, enter Nike. The contract (which should run from the period of 2011 to 2018) has apparently been reported to amount €320m for the period of 7 years, making the French blue shirt the most expensive ever in the history of soccer. So, in three years’ time no more three-barred stripes for the Frenchies (2008 Adidas France jersey featured right), but a nice little Nike ‘checkmark’ instead. The change, which brings an end to the 40+ years relationship between the French Football Federation (FFF) and the German sports apparel manufacturer, has been motivated essentially by… money (well, what else could it be really?). The Nike-FFF contract has been valued to €42.6m a year, i.e. 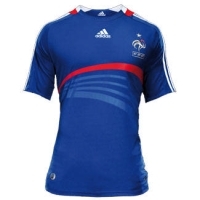 four times as much as what Adidas were previously paying the French federation. Want some more numbers? That’s €12.5 more than what Nike was offering the English FA, and triple the amount what they are paying the Brazilian federation or what Puma is paying the FIGC (Italian federation). “It will be a great opportunity for Nike to ‘catch up’ on the notoriety battle with Adidas” declared Fabrice Ducceschi, general director of Nike France. Indeed, according to the latest studies, Adidas is recognized by over 60% of the French population, against only 42% for Nike. FFF president Jean-Pierre Escalettes is quite satisfied with the operation: “I think it can safely be called a success. The operation will have a positive domino effect on the entire structure of French soccer, from the national team to the amateur clubs. We will now be able to adequately finance the war on doping and violence, as well as the youth academies throughout the country“. It’s a big blow for Adidas, despite the sports company managed to retain contracts with the German and Mexican football federations. As a small consolation, Adidas’s presence within Les Bleus will not disappear completely however: they still maintain individual sponsorship deals with Patrick Vieira, Karim Benzema, and Samir Nasri. But speaking of super business deals, earlier this month the LFP (Ligue de Football Professionel) had announced the renewal of their TV rights contract with premium pay television channel Canal+ and and telecom service Orange: €668m per season for a period of 3 years. You can say what you want about Ligue 1 soccer and the level of play in France, even boring 0-0 draws are quite expensive in the end. This entry was posted on Friday, February 22nd, 2008 at 6:37 pm	and is filed under Money/Finance in Soccer, World News. You can follow any responses to this entry through the RSS 2.0 feed. Both comments and pings are currently closed. I buy only fake jerseys. These sort of news just compels me to do more of the same………..
How can any Federation say no to a deal like this? There’s always a price at which loyalty and tradition are thrown into the wind. €42.6m a year is really hard to say no to, especially if the offer is coming from a company that is a top brand with great product and a commitment to the sport. Don’t you think adidas had a “right to match” clause in its existing deal? No doubt about it, but they couldn’t justify the expenditure. This is typical Nike buying into a sport with the goal of entrenching its brand into the psyche of the French consumer to grow its overall business in that country. This isn’t just about FFF jerseys, cleats and balls, it’s about brand building – starting with jerseys and cleats and hoping that the consumers in France end up also believing in and buying Nike basketball shoes, workout apparel, tennis gear, etc. You’re preaching to the choir Pedro. What you just mentioned is exactly what Fabrice Ducceschi was referring to: the ‘notoriety battle’ with Adidas. And as far as the deal as a whole is concerned, obviously it’s an advantageous operation for both parties involved: FFF get a sh**load of money out of it, Nike gets a huge image boost in the hexagon.